Ian Kennedy is taught by his mom Katrina Kennedy. 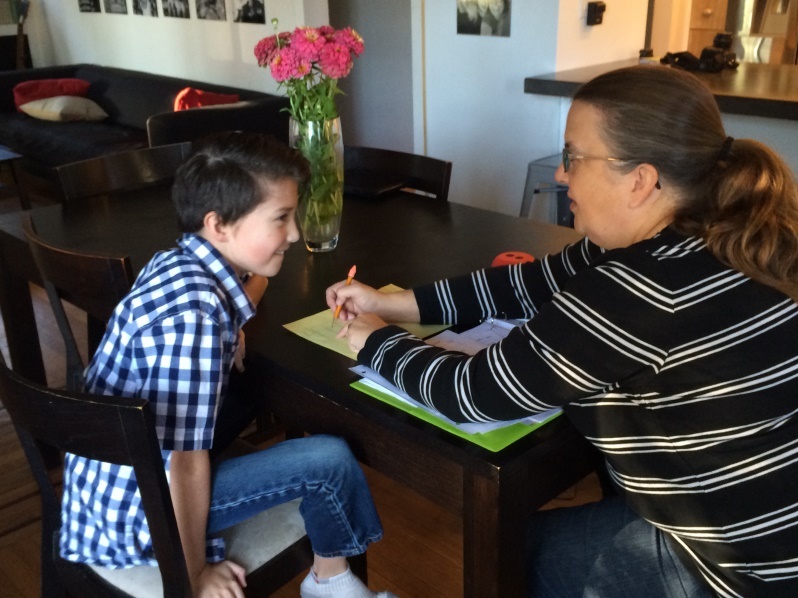 Ian Kennedy and his mom Katrina Kennedy sit at their dining table working on one of their daily lessons. She pulls out a list of words and a timer and Ian begins saying the words as fast as he can. Ian has dyslexia. The exercise is meant to help with his phonological processing. That’s his ability to pull apart the sounds within words and associate the sounds with letters. Ian is an outgoing 10-year-old who has visions of starting his own YouTube Channel and one day becoming a video game developer. But in first grade Katrina and her husband noticed Ian was becoming hesitant to read. In kindergarten he was reading basic words. But he was struggling with the more intense reading lessons that came in first grade. When they expressed concern, Katrina says they were told they should just wait to see how things developed. Ian eventually was diagnosed with dyslexia. Still, Katrina says the diagnosis didn’t make things any easier. Ian was falling behind, working through recess and acting out at home. "About halfway through third grade, we as a family were really having a hard time managing the amount of homework," she says. "Nobody wanted to come home, nobody wanted to face it." Ian and his parents decided Katrina would homeschool him. The change has brought a sense of calm and control back into their lives. But the family remains frustrated by what they saw as a lack of support from Ian’s school. Katrina says the accommodations the school made for Ian only added to his stress. Now a new state law requires schools to consider phonological processing when evaluating a child for special education. Tobie Meyer is with Decoding Dyslexia California. She led the effort to pass the law after she ran into resistance while trying to get educational help for her son’s dyslexia. "The law is going to help future students to be identified or be found eligible for special education services more easily than they had been in the past," she says. The law will also create new guidelines to help teachers and parents identify dyslexia and provide services for students how have it. Dr. Sally Shaywitz thinks the law is a step in the right direction. She co-directs the Yale Center for Dyslexia & Creativity. Shaywood says early intervention is critical to treating dyslexia. So is overcoming the idea that people who have dyslexia aren’t smart. "Part of the definition of dyslexia is that it is an unexpected difficulty in readying,” she says. "Unexpected meaning it occurs in people who are quite intelligent." Shaywitz welcomes a US Senate Resolution defining the disorder and calling on schools to recognize its educational impact. And a recent letter from the US Department of Education to state and local education agencies clarifies it’s OK to use the term dyslexia when discussing a child’s education. Ian Kennedy is reading better because of the exercises he does to recognize sounds within words. And he’s not ashamed of having dyslexia. "I’m proud of having dyslexia. I’m happy to have dyslexia. Even though it doesn’t help me sometimes, I love having it," he says. "I feel unique. I feel like a lot of people don’t know about it, but it’s there." A previous version of this story incorrectly identified Dr. Sally Shaywitz as Dr. Sally Shaywood. We regret the error. A new law directs the California Department of Education to develop a process to help students with dyslexia by the 2017-18 school year.